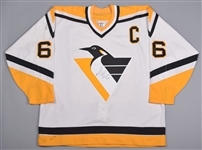 Lot Detail - Mario Lemieux's 1993-94 Pittsburgh Penguins Signed Game-Worn Captain's Jersey with LOA - Photo-Matched! 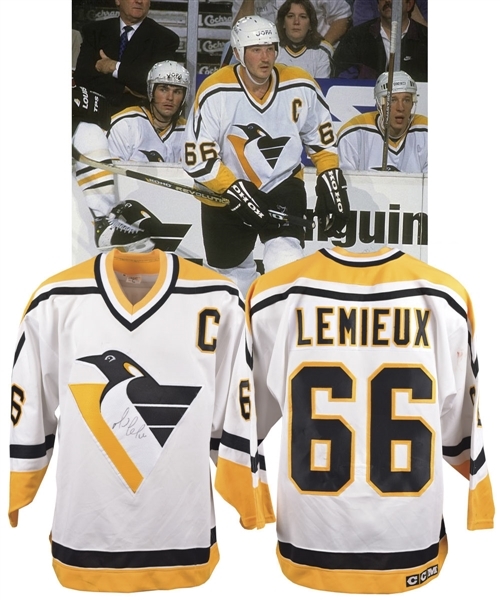 Mario Lemieux's 1993-94 Pittsburgh Penguins Signed Game-Worn Captain's Jersey with LOA - Photo-Matched! 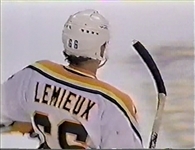 Undergoing his second back surgery in the summer of 1993, Mario Lemieux only appeared in 22 games during the 1993-94 campaign, and despite still recovering from his surgery, he managed an impressive 37 points. We have a signed Penguins captain’s jersey that was worn by the superstar in 1993-94, with this desirable specimen photo-matched. A Maska label with handwritten “66C” and size “54” fly tag are affixed to the collar, with embroidered CCM and NHL crests on the back bottom hem. Styled with an attractive and textured Pens team crest that first saw use the previous season, the solid white V-neck has been accented with oversized black tackle twill sleeve and verso numbers with yellow trim, with “Lemieux” across the affixed nameplate in matching material. 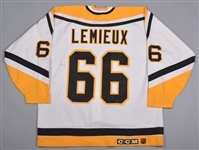 The bottom hem has been shortened/hemmed-up, with this done after use from Lemieux, with it believed that the team prepared the jerseys for future possible back-up and/or Stanley Cup playoff use. 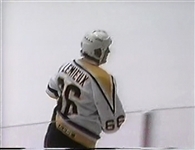 Photo-matched to four different games in 1994, Lemieux registered at least a single point in each contest, with the iconic HOFer signing the team crest in black marker, with the signature blending into the background material somewhat. An LOA from Penguins Chronicles will accompany. Sporting stick marks over the lower front along with a few minor marks just above the team crest, additional dark marks are visible over each sleeve, with red goalpost paint transfer over the reverse, just beneath the right shoulder. DVDs of each of the games the jersey is photo-matched to will accompany, along with two screen grabs from those videos. Video from the March 22nd match vs San Jose (Lemieux scored 2 points, 1 goal and 1 assist), the March 24th game vs Ottawa (Lemieux netted a goal), the April 3rd match vs Boston (Lemieux scored 4 points, 2 goals and 2 assists) and the April 4th match vs Tampa Bay (Lemieux had a single assist) has all been matched to the big set of black marks and the red paint transfer over the reverse upper right sleeve. We should note that the jersey was also possibly worn on March 12th vs the Rangers.